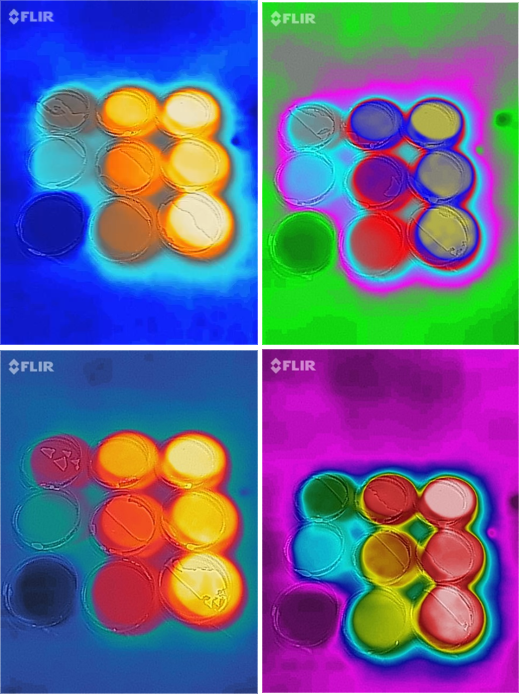 Funded by the National Science Foundation, we are exploring the feasibility of using thermal imaging as a universal indicator of chemical reactions. The central tenet is that, as all chemical reactions absorb or release thermal energy (endothermic or exothermic), we can infer certain information from the time evolution and spatial distribution of the temperature field. To prove the concept, we first chose titration, a common laboratory method of quantitative chemical analysis that is used to determine the unknown concentration of an identified analyte, as a beginning example. A reagent, called the titrant, is prepared as a standard solution. A known concentration and volume of titrant reacts with a solution of analyte to determine its concentration. The experiment we did today was an acid-base titration. An acid–base titration is the determination of the concentration of an acid or base by exactly neutralizing the acid or base with a base or acid of known concentration. Such a titration is typically done with a burette that drops titrant into an Erlenmeyer flask containing the analyte. A pH indicator is used to determine whether the equivalence point has been reached. The pH indicator usually depends on the analyte and the titrant. But a differential thermal analysis based on infrared imaging may provide a universal indicator as the technique depends only on the heat of reaction and thermal energy is universal. Figures 1 and 2 in this article show the results of the NaOH+HCl titration, taken using a FLIR ONE thermal camera attached to my iPhone 6. A solution of 10% NaOH was prepared as the analyte of "unknown" concentration and 1%, 3%, 5%, 7%, 10%, 12%, 15%, 18%, and 20% HCl were used as the titrant. The experiment was conducted with a 3×3 array of Petri dishes. Hence, we call this setup as dish-array titration. Preliminary results of this first experiment appeared to be encouraging, but we have to be cautious as the dissolving of HCl after the acid-base neutralization completes can also release a significant amount of heat. How to separate the thermal signatures of reaction and dissolving requires some further thinking. My Daughter Heard About an Earthquake. How Do I Explain It?